We've been teasing out a few of our 40+ Gizmodo Gallery gadgets on display next week in NYC, like the 103-inch Panasonic plasma, Apple prototypes and the first Walkman. 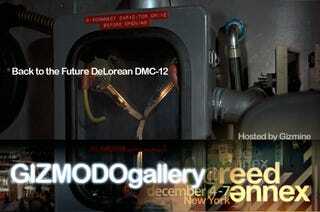 But did I mention we'll have a DeLorean parked outside the Gallery next Friday night December 5th, coinciding with the reader meetup? No? Did I mention its a car with full Back To the Future props. No? Huh, funny. I probably should have told you that earlier. Anyhow, here are the details for the reader meetup, which I hope you can come to. Doug from Gizmine is coming, since the Gallery is partly his creation, and so will Adam, Benny, Matt, Jesús, John Mahoney, Seung the Intern and Chris Mascari. I'll be there, too, so please come on by and say hello, whether you're OMG Ponies or Buick Lesabre who are some of the best daily commenters a blog could ever ask for, or a casual Giz reader. I welcome you! I'd also like to take the time to say thank you to Jesús Diaz for the wonderful banners in all the Gizmodo Gallery posts. Man is a rare talent. The Annex is having another event for someone else at 10 and we'll likely wander somewhere else before then, so get there early so we can roam Manhattan like a pack of wild nerds.